To American ears, the word ‘Limburg’ conjures up the mighty stink emitted by so-called Limburger cheese. In one of Mark Twain’s stories, its smell is even mistaken for that of a corpse. And the cartoon character Mighty Mouse can only be weakened by Limburger cheese – a bit like Superman with Kryptonite. In Europe, where the same cheese is known under different names, ‘Limburg’ usually refers to one of four places. There is the German city of Limburg an der Lahn and the Belgian city of Limbourg. Furthermore, both Belgium and the Netherlands have a province called Limburg. Both provinces were unified into one administrative region by the French from 1795 onwards. This territory was known as the ‘Department of the Lower Meuse’ (Département de la Meuse inférieure) after the river that flows through it. 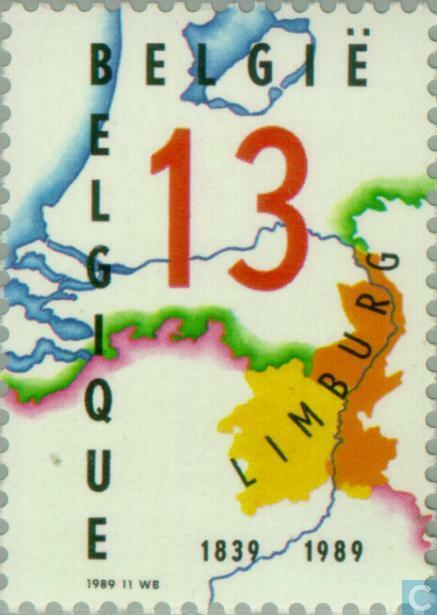 Later, when present-day Belgium, Netherlands and Luxemburg formed one state as the United Kingdom of the Netherlands (1815-1830) it was renamed the province of Limburg, after the city of Limbourg (which incidentally formed no part of the province of Limburg, as it lies in the Belgian province of Liège). The stamp as issued by the Dutch postal service, valued at 0.75 guilders. Image found here at Dan's Topical Stamps. When Belgium split off from the Netherlands in 1830, Limburg was going to go to Belgium in its entirety. But the Dutch mounted an initially successful campaign, which had to be called off under international pressure. This military stalemate is at the basis of the split of Limburg in a western, Belgian half and an eastern, Dutch one, as the city of Maastricht remained occupied by a Dutch general. In 1839, the Treaty of London officialised the split, thus providing the Netherlands with its present-day borders and with its southern ‘tail’. Despite a separation that has lasted for about 175 years, a feeling of kinship between the Dutch and Belgian halves of Limburg persists, mainly due to similarities in culture and dialect (of Dutch) and by feelings of neglect by their respective ‘far-away’ capitals, The Hague and Brussels. This stamp was issued by both Belgium and the Netherlands in 1989 at the 150th anniversary of the Treaty of London. That treaty not only lost Belgium half of Limburg, it also required the new country to remain perpetually neutral (which it did in the run-up to both World Wars – after the second one, Belgium was one of the founders of NATO). The stamp as issued by the Belgian postal service, valued at 13 Belgian francs. Image found here at catawiki. The design on the stamp shows the territory of the Netherlands from the southern IJsselmeer to northern Belgium. The territory of Limburg west of the Maas River is colored a light orange and belongs to Belgium, while the territory north of the Netherlands-Belgium border and west of the Maas is a darker orange and belongs to the Netherlands.